It’s that time of year that we hold ourselves accountable for new goals and set expectations of the coming year. However, how often do we resolve to do the same things year after year. Do we even stop to write them down or do we have the list memorized from years prior. 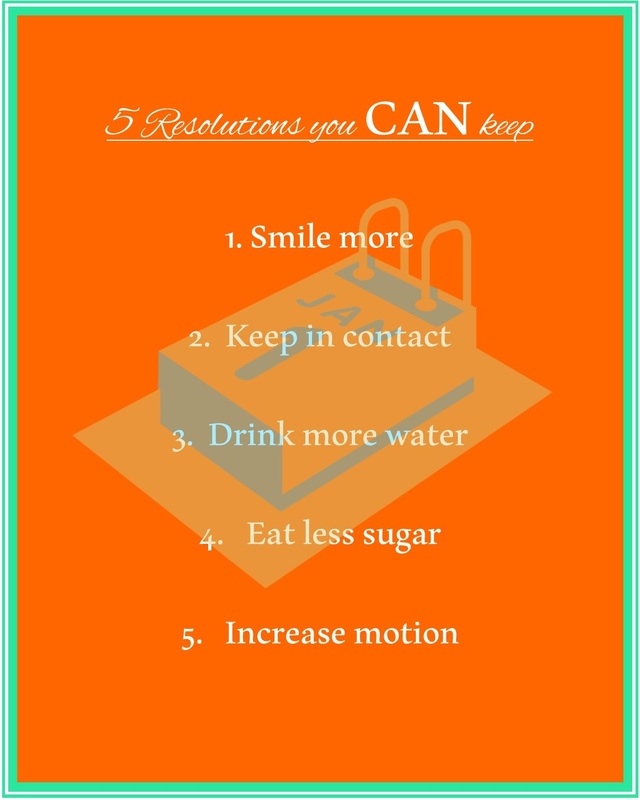 Resolutions become moot after a few weeks or even days. However, this year can be different. Commit to 5 items that will surely make a difference across the year to improve relationships and increase energy, allowing you to conquer the world. Simple and easy principles of betterment. No extra time required! You can accomplish it whenever and wherever you are. Is it easy? Maybe not, but the fact is we will be happier if we do. It may be responsible for mending bridges, opening doors and stabilizing relationships. Just like my mother told me – fake it, until you make it. Your world will be brighter and you may bring joy to those who need it. Friendship is eternal and is more valuable than we may even be aware of. How many of us have lost contact with treasured friends, co-workers and even family members. Reach out to an individuals and build relationships. Even if it’s once a year. Even if its facebook poke. Keeping in contact may require some additional effort but its overall purpose is to let people know you care and bring us closer together as human beings. One minute of our time may improve the 24 hours of our day. You never know when you may be the needed friend or when you may need that friend. It can’t hurt, it saves money and it increases our energy over time. Is there anything debatable about this? It even decreases wrinkles if I’ve read reputable sources. You CAN definitely do this. Push away the soda, drive past Starbucks and reach for a water bottle. Dehydration even mildly, causes mood swings, headaches and fatigue. And the list goes on. Even if it’s one more glass a day than we are drinking currently. It is estimated that 50% of the world population is dehydrated with the US nearing 75% dehydration. Why isn’t it we didn’t have the energy to do anything? This might just solve the problem. I am guilty of eating way to much sugar. My love affair with finding the next carb filled, gluttonous item, to fulfill the relationship with my sweet tooth has controlled me far to many years. I am not alone. A radical change may be fruitless as we bound back to our old ways in the face of temptation. However, one less cookie is beneficial. Eating fruit as a replacement improves our fiber intake. Having power over this addictive relationship will be unleashing our true potential. That might be an small exaggeration. Increased energy, smaller waste line, less dental problems and decreased heart disease, are just a few factual benefits. The quality of our long term health would be greatly improved. Notice that I didn’t say exercise. Commit to demonstrate the physics of energy. Convert potential energy to kinetic energy. Don’t stay sedentary. Movement throughout the day is better for our overall health. Take the stairs vs. the elevator. Park further away from the door at a store or office building. Wash your car by hand. Any activity that keeps you moving by burning energy will benefit you. Even in little doses from what you may be currently doing. Our circulation will increase, our blood will flow and move oxygen will reach our brain, allowing us to think more clearly. Little effort = Huge outcome. Five resolutions you CAN keep.